Looking for an exciting salad sure to impress at your next get together? 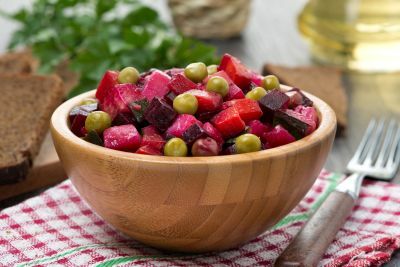 This beet salad is full of flavour with the sweet earthy flavours of the beets being complimented with the freshness of the herbs and the savoury, salty flavours of the olives. Not only is this dish full of flavour it is actually good for you too! Did you know that beetroots contain valuable nutrients that can help lower blood pressure, boost stamina and support your immune system? This salad also goes a long way to support and fight inflammation. Beetroots contain a source of betaine, a nutrient that helps protect us from different environmental stress. It also helps reduce inflammation, enhance performance and protects internal organs. Beets aren’t the only ingredient that should be highlighted in this dish. Both the apple cider vinegar and raspberry vinegars are alkalising in nature making them a fantastic support to our body’s detoxification process. With many people’s diet typically being too acidic, ingredients such as the vinegars are a great addition to incorporate in to your daily diet. Cut off the ends of the beets. Wash well & cook in a pot of boiling salted water until tender. Drain & remove skins under running cold water (you may want to wear gloves for this as the beets will stain your skin). Dice in to 1 cm cubes and set aside. While the beets are boiling, in a separate pot add the potatoes in to boiling water and also cook until tender. When cooked, drain and allow to cool. Dice in to 1 cm cubes and set aside. Mix together all the dressing ingredients, if you like add them to a glass jar with a lid and shake well. Peel and slice the spanish onion, deseed the tomatoes and dice, finely chop the garlic cloves along with the parsley and coriander. Combine the peeled, cooled, diced beets and cooled diced potatoes in a salad bowl with the onion, tomato, garlic, cilantro & parsley. Pour over the dressing, toss gently & chill for 30 minutes. Upon serving garnish with olives.